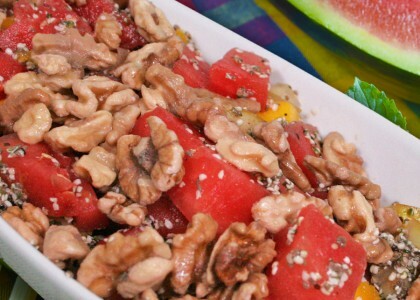 This perfect fruit salad combines both walnuts and watermelon. 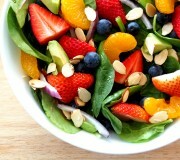 Be sure that your good fruit salad includes some healthy fats and proteins. A walnut fruit salad can be made with a variety of ingredients, but this combo is perfect for the summer time and can help you in your goal to lose weight this summer quickly. There are many good fruit salad combos out there and it is always good to mix it up. In a large bowl combine chopped fruit, soaked nuts, and seeds. Add squeezed juices of lemon and lime plus salt and mix together. Drizzle a little honey or agave onto salad if desired. Each bite of this delicious salad is light and has a burst of many flavors. 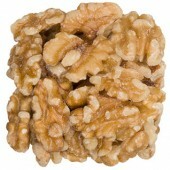 There is the refreshing sweetness from the watermelon and mango, plus the tanginess of citrus and finally the buttery soft crunch of the Eatnuts.com Walnuts to make you feel refreshed and satisfied. 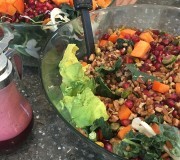 It is the time of year when many people are searching for salad recipes, and as the weather begins to heat up healthy summer salads become more and more popular. 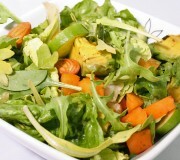 This Healthy Summer Salad recipe uses apricots which are plentiful in these warm summer months.